Home appliance firm Bosch is giving back to those who need it most. The company received a request for help from the Abu Dhabi charity Labor of Love, an organization that assists more than 100 women living in labor camps. According to a statement from Angel Wesley, the head of the charity, Bosch generously offered the women 100 washing machines. With so few appliances available previously, Bosch’s gift will certainly be put to use in Abu Dhabi. “In our work, which includes various programmes and initiatives, [the women] often ask us for specific items that will lessen the burden of their already busy and demanding schedules,” said Wesley. “We were recently asked by the women of West Coast cleaning company, who work in hospitals and schools throughout the UAE, if we could supply them with additional washing machines at their accommodation in Musaffah in Abu Dhabi because the women are doing their weekly laundry on Friday – their off day. 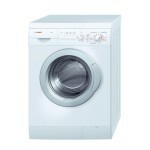 To our and their immense delight Bosch offered to provide three brand new, top quality washing machines. Bosch’s washing machines are sure to help out the women of the labor camp.